AAA Equipment Rentals is your source for scissor lifts in Nyack, NY. 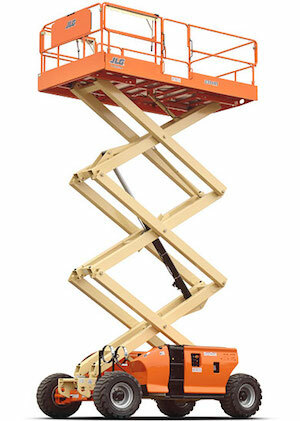 We rent, sell, and service a variety of scissor lifts and aerial platforms. Our fleet of electric scissor lifts have platform heights ranging from 19 – 32 feet with working heights of up to 39 feet. These models can hold two operators and support up to 500 lbs. Our rough terrain, diesel-powered scissor lifts are equipped with foam-filled tires, allowing you to easily navigate uneven surfaces like mud and gravel. These lifts have maximum platform heights of either 32, 33, or 40 feet. These models can hold two operators and support up to 1,500lbs. When a ladder just isn’t tall enough for the job, scissor lifts let you get to where you need to be. They’re perfect for elevated construction jobs, painting, and ceiling work, but are also great for sporting events and film sets. From electric to diesel and dual-fuel models, we have what you need to get the job done. Whether you’re indoors or outdoors we carry gas, diesel, propane, or electric powered scissor lifts. We have the right lift for your job. We carry from 19 ft all the way up to 50 ft with platform weights of 500 lb to 1500 lb. We carry JLG, Genie, SkyJack, Snorkel, and many other brands to fit whichever need you might have.